KARACHI: Two trains collided in the city's Landhi area early Thursday morning, leaving at least 22 people dead and resulting in injuries to 65 others including children. The accident occurred in Gaddafi Town Landhi at 7:18 AM when Zakaria Express collided with the stationary Fareed Express. Two bogies of Fareed Express and one bogie of Zakaria Express were completely destroyed due to the collision. Fareed Express was at Juma Goth Train station when Zakaria Express crashed into it. Initial investigation reveals that the driver of Zakaria Express ignored the signal. 21 bodies and 65 injured have been brought to Jinnah Hospital, said Dr. Seemi Jamali, Head of Emergency Department at Jinnah Hospital. "Many among the injured have head injuries and some are in critical condition," she added. "I am dying, I am dying, please, please, I am dying," cried Abdul Ghaffar, 55, as doctors tried to move his legs and hands. He appeared to have multiple injuries, while his children and wife were also wounded and lay on beds nearby. Other victims appeared too stunned to talk. Many had head and foot injuries, and at least one man had his leg amputated below the knee. The crash resulted in traffic jam, and ambulances carrying the injured got stuck on the roads. Emergency has been declared at Jinnah Hospital, Abbasi Shaheed Hospital and Civil Hospital. Fareed Express was coming to Karachi from Lahore, while Zakaria Express had set off from Multan. All trains from Karachi have been suspended till rescue work is completed. Trains on their way to Karachi will be stopped at another station before they reach Landhi. Officials said rescuers armed with metal-cutting equipment and heavy cranes had managed to pull all the passengers from the twisted wreckage. 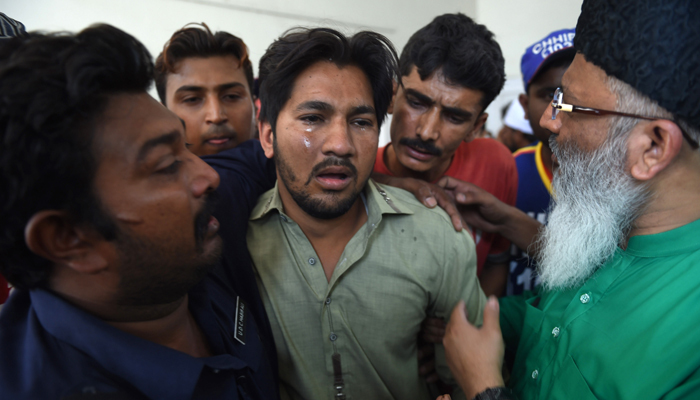 "No-one is left inside," Ijaz Ahmad Khan, a Karachi administrative official, told reporters at the scene. Prime Minister Nawaz Sharif and President Mamnoon Hussain expressed grief over the accident and offered their condolences to the families of the victims. President Mamnoon Hussain ordered investigation into the collision and announced financial help for the victims' families. Passenger Ajab Gul told AFP he was on his way to his factory job when he witnessed the accident. "Suddenly another train came speeding in and smashed into the parked train," he said, describing the sound of the crash as "huge". "There were clouds of dust and smog. After that we heard screams. People inside the collided trains were screaming and crying." Onlookers rushed to their aid, he said, adding that he had helped pull 17 people, including women and children, from the wreckage. But, he added, "there were many other people trapped inside... we could not get them out." Speaking to journalists in Islamabad, Railway Minister Khawaja Saad Rafique said the accident was caused through a human error and the signal system of the Railways was functioning perfectly. According to Rafique, the driver of Zakaria Express was at fault as he ignored signals. "The driver and assistant driver are missing and there is a search to find them," Rafique said, adding that the initial report would be completed within 72 hours. He announced Rs 1,500,000 for as compensation for the dead, and Rs 300,000 as injured. He said that he will reach Karachi shortly to investigate the situation at the site. 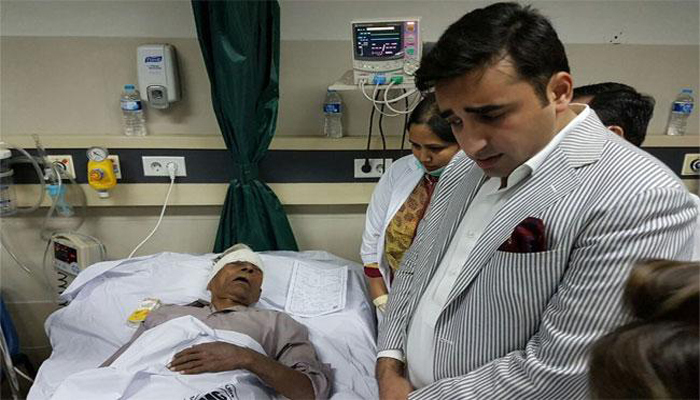 Pakistan Peoples Party (PPP) Chairman Bilawal Bhutto Zardari visited those injured in the train accident at JPMC. The PPP chairman said there should be no politics on terrorism and accidents. Bilawal sympathised with families who had lost their loved ones. He also asked for the best medical treatment to be provided to the injured. Bilawal said there was not a single emergency centre in Pakistan and it would be the provincial government’s focus to build one in Sindh. Chief Minister Sindh Murad Ali Shah also paid a visit to the injured. Train accidents are not unheard of in Pakistan. During 2015-16 three major train accidents took place. On September 15 this year at least six people were killed and over 150 injured after Karachi-bound Awam Express collided with a freight train near Multan. On November 17, 2015 at least 12 people were killed and over 100 injured when the locomotive and several bogies of Jaffar Express train derailed near Bolan area of Balochistan. On July 2, 2015 four bogies of a special train carrying Pakistan military troops and their families to Kharian fell into a canal near Jamke Chattha in Gujranwala, killing two people and injuring 85.